Continuing our quest to visit lesser known spots, the drive today was VERY short. Destination was Inga Lake Recreation Site, only 115 km northward. We weren't sure what was there, but it was down a road only 2 km from the Alaska Highway. According to the Backroad Mapbook the access road was reasonable to drive. And so it was. The recreation site is at N56 37 05.0 W121 38 05.7. There was no fee to stay. The Backroad Mapbook said the fishing was reasonable so Steve headed out. He caught one fish; we figured the Russians had taken all the fish. Inga Lake was very marshy and windy when we were there. On the road at 9 a.m. Some smoke in the air so picture taking wasn't great. Past Fort Nelson we turned north on the Liard Highway to explore a recreation site. 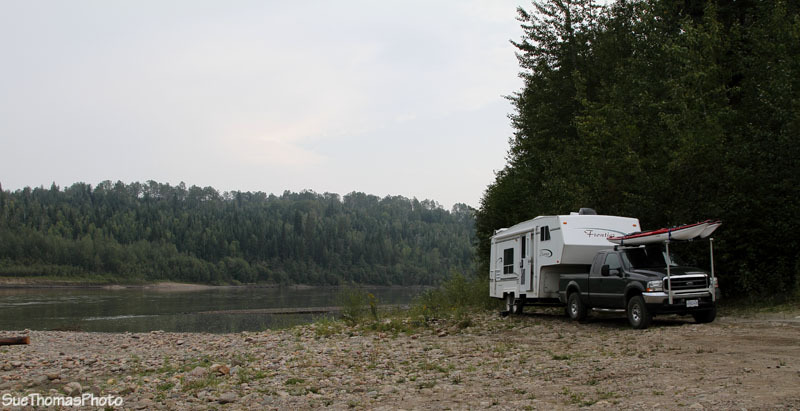 Ten kilometres north of the Alaska Highway, the Beaver Lake recreation site was okay. It was clean, tidy and accessible with the truck and fifth wheel. But the lake's banks were steep and the shoreline was marshy. 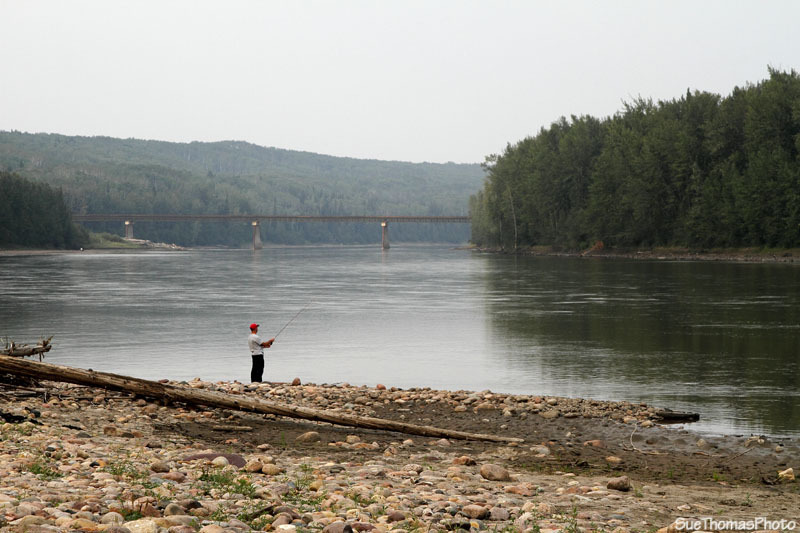 Continued northward to the Fort Nelson River, which is about 60 km north of the Alaska Highway. I recalled seeing some back roads on the maps. Sure enough, just past the Fort Nelson River bridge there was a left turn, then another left turn and soon we were at the river's edge. Steve fished while I moseyed about. The hazy forest fire smoke was still in the air. Tazz played in the water and kept her eyes open for the Russians. We hoped we were out of their territory! It was a pleasant evening in a quiet spot.